Draft: 2015, Philadelphia Phillies, 2nd rd. Scott M. Kingery (pronounced KING-urr-ee)… 2012 graduate of Mountain Pointe High School (AZ)… Attended the University of Arizona… 2015 Pac-12 Player of the Year… Named a 2015 First-Team All-American by Baseball America…Played in the 2006 Little League World Series… Hobbies: Reading, movies and hiking… Signed by: Brad Holland. 2 at 2nd base and 2 in RF. Won the Paul Owens Award as the best player in the Phillies minor league system... Won the minor league Rawlings Gold Glove Award for 2nd base...Among all minor league players, ranked 4th in total bases (288), T-4th in runs (103) and T-9th in XBH (63)...Was the only player at the major or minor league level to have 25 HR and 25 SB...Was a non-roster invitee to ML spring training...Began the season with Reading (AA)... Did not make an error through his first 35 games of the season, 4/7-5/19, or in his final 47 games (including playoffs), 7/17-9/4...Was named Phillies Minor League Defender of the Month in April, and again in August...Named Eastern League Player of the Month and Phillies Minor League Hitter of the Month for May (.325, 7 2B, 3 3B, 3 HR, 10 RBI)...Was promoted to Lehigh Valley (AAA) on 6/26...At the time of his promotion, led the EL in runs (62) & SLG % (.608), T-1st in HR (18), ranked 2nd in SB (19) and 7th in AVG (.313)...Played for Team USA in the All-Star Futures Game (0-1), 7/9 at Marlins Park...Had a 16-game hitting streak, 7/14-30 (.314, 2 2B, 3B, HR, 7 RBI)...Led the International League and set a Lehigh Valley record with a 23-game hitting streak, 8/2-25 (.320, 6 2B, 2 3B, 3 HR, 5 RBI)...Became the 1st player in Lehigh Valley history to lead off the game with an inside-the-park HR, 8/19 at Charlotte...Had the first 3 multi-HR games of his professional career...Combined, batted .304 (165-543), 29 2B, 8 3B, 26 HR, 65 RBI, 41 BB, 29 SB, .359 OBP, .889 OPS in 132 games between both levels...Following the season, was named by Baseball America as the 3rd-best prospect in the Phillies minor league system, 31st-best prospect in baseball and top 2nd base prospect. 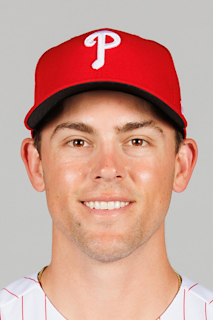 April 20, 2019 Philadelphia Phillies placed SS Scott Kingery on the 10-day injured list. Right hamstring strain. March 25, 2018 Philadelphia Phillies selected the contract of SS Scott Kingery from Lehigh Valley IronPigs. January 17, 2018 Philadelphia Phillies invited non-roster 2B Scott Kingery to spring training. July 13, 2017 Lehigh Valley IronPigs activated 2B Scott Kingery from the temporarily inactive list. July 8, 2017 Lehigh Valley IronPigs placed 2B Scott Kingery on the temporarily inactive list. June 26, 2017 2B Scott Kingery assigned to Lehigh Valley IronPigs from Reading Fightin Phils. January 11, 2017 Philadelphia Phillies invited non-roster 2B Scott Kingery to spring training. July 25, 2016 2B Scott Kingery assigned to Reading Fightin Phils from Clearwater Threshers. April 2, 2016 2B Scott Kingery assigned to Clearwater Threshers from Lakewood BlueClaws. June 25, 2015 2B Scott Kingery assigned to Lakewood BlueClaws. June 16, 2015 Philadelphia Phillies signed 2B Scott Kingery.